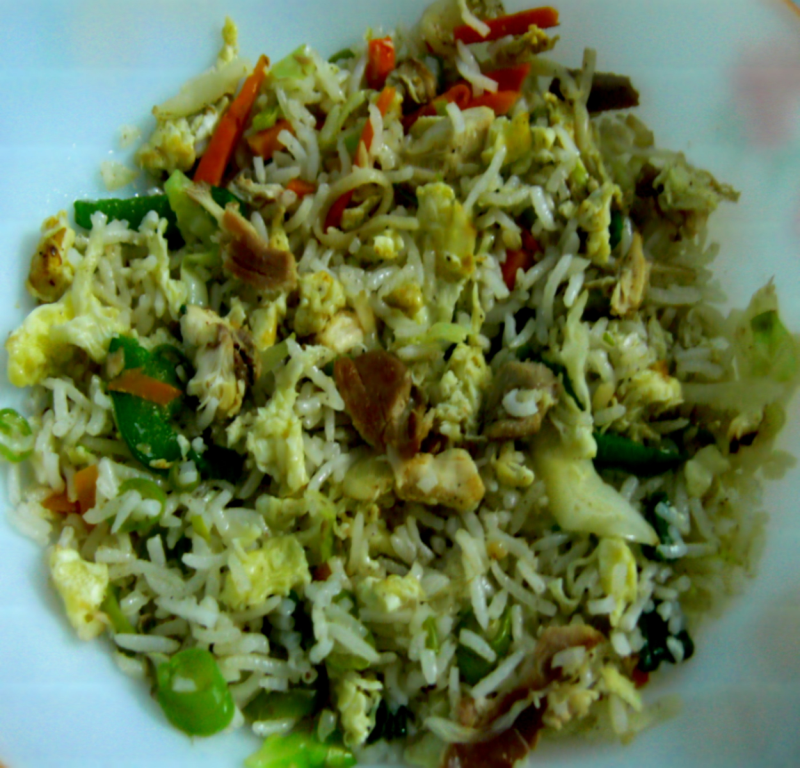 Chinese chicken fried rice is an all time fav rice for Indian Chinese Food Lovers.Try this at home and enjoy .U can also try Vegetable Fried Rice, Egg Fried rice, Prawns fried rice,Paneer Fried rice or Mushroom fried rice the same way. Wash basmati rice and drain it.Saute the washed rice in 2 tsp ghee and 2 tsp refined oil for 3 mins.Cook the rice in a pressure pan with 1 tsp salt and 2 cups water upto 1 whistle. Leave it for 15 mins. Cut the vegetables,wash them well and keep them aside. Beat the eggs, add 1/2 tsp salt and 1 tsp pepper powder and stir-fry in 1 tbsp oil. Heat 1 tbsp oil in a kadai, add chopped garlic,chopped onions, 2 chopped green chillies and saute for 3 mins then add the chopped vegetables,chopped spring onions(1 tbsp),chopped celery (1 tbsp),boiled and shredded chicken pieces, soya sauce, ajinomotto, boiled basmati rice, 1 cup chicken stock and 1 tsp salt.Stir continuously for 5 mins. Add the stir-fried egg pieces,remaing celery and spring onions and mix well till the chicken stock rund dry. Serve this chicken fried rice hot with Chicken Manchurian or Tandoori Chicken.